So there he sat. Mr Haydn. Alone. Over 200 years ago. Tinkling away on a pianoforte. And there you are. Alone. Looking at the exact same instrument. Standing in the exact same room where one of the world’s greatest-ever composers slept and composed. Astonishing. You don’t have to be a fan of classical music (I’m not, particularly) to enjoy the Haydn House in Vienna. In 1793, aged around 61, Haydn and his wife bought a house in Gumpendorf, which (back then) was a leafy and quiet village outside Vienna. It would be four years until he moved in (among other things, he filled the intervening time with a long trip to London), but it became his final residence until his death there in 1809. This coincides with perhaps his period of greatest celebrity. Fortunately for us, the house has survived. The fine folk at the Wien Museum turned it into a small, permanent Haydn exhibition, and the house itself was completely restored with delicate historical accuracy just a few years ago. What’s inside the Haydn House? Rather incongruously, you’re greeted by a virtual parrot when you enter the courtyard through the big wooden doors (Haydn bought one in London). Beyond is a peaceful garden, built in the style of the early 1800s, with a mix of fruit-bearing and ornamental plants. In summer, you can sit in the shade of the giant chestnut tree and contemplate your next symphony cold drink. The house (now a museum) is largely devoid of fittings and furnishings, since most of these were sold off after Haydn’s death. The exhibition on the ground floor, where the servants originally worked, has small sections dedicated to the Vienna and Gumpendorf of the time (early 1800s), Haydn’s residency and London trips, and those selfsame servants. I’ll never tire of seeing pictures of rural idylls like late 18th-century Gumpendorf, and always smile at the contrast to the streets outside in modern Vienna. The exhibition is not huge but gives you enough flavour to understand the context of Haydn’s later life. Plus you already begin to see that he was no ordinary man. For example, he left his servants more in his will than all but one of his actual family members received. Upstairs is where acolytes can feast on the musical genius of “Papa Haydn”. When you get to the top of the curving stone steps, start on your left. The small room is where Hadyn slept and spent his mornings pottering about on a clavichord as he came up with his next pieces. Not just any clavichord, but the very one standing innocuously in this room. The rest of this area includes the reception room, salon and the room where he displayed the many gifts he received throughout his career. The items are few, but, again, enough to give you a flavour of the man and his work. Little tidbits on the work that went into The Creation and The Seasons, both composed in this house (there’s a first edition score of the latter on display, for example). A list of visitors to his home, including the likes of Beethoven. Insight into his slow decline with age; how the spirit was still willing and creative but the body and memory weak. Most poignantly, perhaps, was his visiting card, which simply states alongside some bars of music, “All my strength has gone, old and weak am I”. To the right of the stairs, there is a little more information on his death during Napoleon’s second invasion of Vienna. If you thought celebrity worship was a modern invention, the information here will put you right. Haydn’s parrot, for example, sold for a fortune. All-in-all, despite the relatively spartan displays, you get an excellent feel for Haydn’s character, his work processes, and the context in which he lived. Strange to say, I came away thinking I’d probably quite like him, not least because of his considerable charity work. All-in-all, it was a thoroughly enjoyable time spent learning about one of the world’s most important composers. By the way, the last room upstairs is dedicated to Brahms (whose Viennese flat is – alas – no more). You’ll find furniture, a biographical timeline, portraits, etc. The paintings of his piano room and desk were curiously fascinating. There was a big bust of Beethoven over his piano, and what looks like the model of a lobster on his desk. Each to his own, I suppose. At the time of writing, the museum is open Tuesday to Sunday almost all year, from 10 am to 1 pm and 2 pm to 6 pm. Adult entrance tickets cost €5, with various concessions (kids are free, for example). The Vienna Pass (see a review) gets you in for nothing. Although relatively central, the house sits in a little hole as far as public transport is concerned. So you’ll need to walk for a few minutes to get there. The 57A bus runs along Gumpendorfer Straße below Haydngasse (get out at Brückengasse or Hirschengasse). But your best bet is probably to take the U3 subway to Zieglergasse and walk down (see the map below). 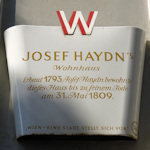 The Haydn House is not too far from Westbahnhof, either, one of Vienna’s major rail stations and reached by the U3 and U6 subways, as well as trams 5, 6, 9, 18, 49, 52 and 60. If you come out of the Westbahnhof subway station, look for the “Innere Mariahilfer Straße” exit.